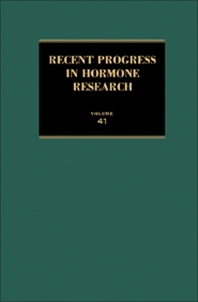 Recent Progress in Hormone Research, Volume 41 covers the proceedings of a Laurentian Hormone Conference held in late August 1984 at the Homestead in Hot Springs, Virginia. The book presents papers on the hormone-receptor interactions; the biosynthesis, secretion, metabolism, and mechanism of action of the steroid hormones; and the mechanisms of action of thyroid-stimulating hormone (TSH) and TRH. The text also includes papers on the molecular characterization of a brain specific mRNA; and the factors affecting changes in frequency and amplitude of GnRH pulses and the resulting functional consequences in various mammals including humans with disorders of fertility. Papers on the biological heritage of mammalian endocrinology, such as the actions of urotensin I in mammals and fishes; and the clinical implications of the glycosylation and posttranslational processing of the TSH are also encompassed. Endocrinologists, neuroscientists, biochemists, biophysicists, and scientists involved in hormone research will find the book invaluable.